Just like Grandma used to make! 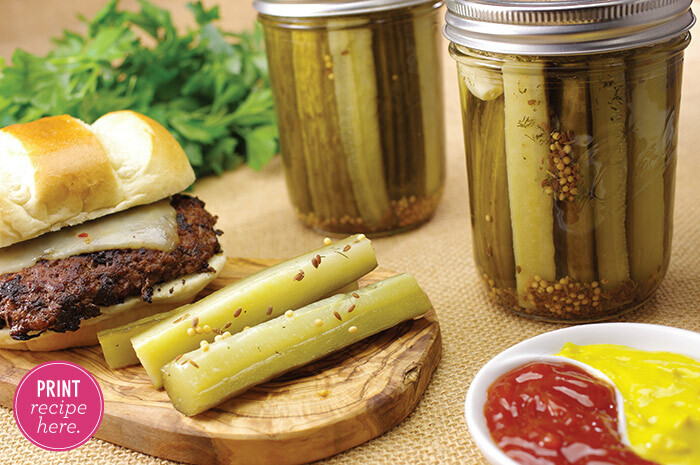 Bring back the memories of summertime pickling with Grandma with this traditional dill pickle recipe. 1. 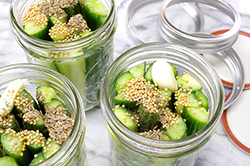 In a large clean crock, glass or stainless steel container, layer cucumbers and ice. 2. 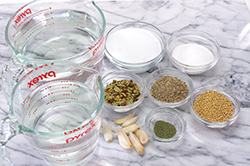 In a large glass or stainless steel bowl, dissolve 1/2 cup (125 ml) of the pickling salt in 4 cups (1 L) of the water. Pour over cucumbers and add cold water to cover cucumbers, if necessary. Place a large clean inverted plate on top of the cucumbers and weigh down with two or three quart (1 L) jars filled with water and capped. Refrigerate (or let stand in a cool place) for at least 12 hours, but no longer than 18 hours. 2. 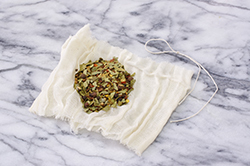 Tie pickling spice in a square of cheesecloth, creating a spice bag. 3. In a large stainless steel saucepan, combine remaining 8 cups (2 L) water, vinegar, remaining 3/4 cup (175 ml) pickling salt, sugar and spice bag. 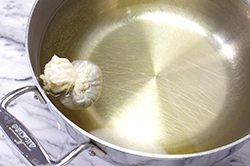 Bring to a boil over medium-high heat, stirring to dissolve salt and sugar. Reduce heat, cover and boil gently for 15 minutes, until spices have infused the liquid. 4. Transfer cucumbers to a colander placed over a sink and drain. Rinse with cool running water and drain thoroughly. 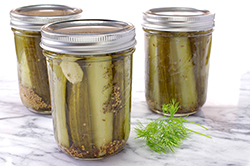 Pack cucumbers into jars to within a generous 1/2-inch (1 cm) of top of jar. Add 1 tsp (5 ml) mustard seeds, 1-1/2 fresh dill heads (or 1 tbsp/15 ml dill seeds or finely chopped dillweed) and 1 clove garlic, if using, to each hot jar. Ladle hot pickling liquid into hot jar to cover cucumbers, leaving 1/2-inch (1 cm) headspace. 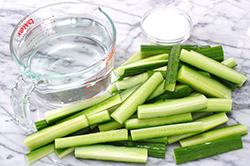 Remove air bubbles and adjust headspace, if necessary, by adding more hot pickling liquid. Wipe rim. Center lid on jar. Screw band down until resistance is met, then increase to fingertip-tight. You can also use this recipe to make seven quart (1 L) jars. 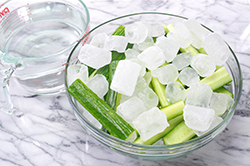 Simply double the quantities for all ingredients except the cucumber purchase weight, which becomes 14 lbs (6.4 kg), and ice cubes, which remains constant. Process quart (1 L) jars for 15 minutes. Ingredient quantities are approximate. 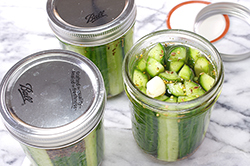 Variations in the sizes of pickling cucumbers and jars dictate the number of pickles that can be placed in each jar; This, in turn, affects the quantity of liquid required.